Prior to hearing the report, Chairman DiFlavio stated that he was made aware that the public notice sign was not posted until Friday, October 5, clearly less than the minimum 20 days’ notice required under the Planning Act. He was quick to address this deficiency and stated that this was an oversight and therefore any decision on the report would be deferred until a further public meeting was held (conveniently occurring after the election). He stated that 330 paper notices had been mailed out as well. Other members of the public reiterated that due to this lapse, the meeting should not proceed to hear the application. The Chair stated that it was reasonable to hear those who had shown up for this meeting. A representative of SGL, the peer review consultant, and Mr. Basic, Deputy Director of Planning, presented an overview of the report. Members of the public stood up to once again address issues raised at the previous two Open Houses held on March 27 and May 29, viewable at this link and this link. The purpose of merging of the properties and laneway should be clearly stated. Staging of construction and protection of heritage properties should be looked at now, not at the site plan stage, as this is a unique situation dealing with sensitive heritage properties in very close proximity to the site. Site and road snow removal and storage was not addressed in the report. Mr. Basic noted most parking is provided in-building so that there will not be a lot of snow. Public Works had not provided comment on Doran Avenue snow removal. Chair DiFlavio asked why this hasn’t been addressed. Reduced rear yard setback to 4.7m from Doran where 7.5m is required. Also, the property adjacent to the west (4 Doran) has a reduced setback of less than a metre. Placement of the traffic counting meter for the traffic study. Not placed in as suitable location where it would capture the most traffic, why not? Mr. Basic indicated that he could not answer and would follow up with the traffic consultant. Location of the concrete garbage pad. Mr. Ariens indicated that it would be addressed at the site plan stage, that it would be the responsibility of the condo corp, and may be a private contractor. He also stated that no one wants to see a concrete pad with garbage. Sale of the laneway and easement for public access. Will it be made available to other property owners? How will that sale occur? Mr. Basic stated that the public laneway provides access to garages on Doran and some semi-detached units on Ontario St. These properties will benefit from improved accessibility. Most of the laneway width is 9’ or less as some Doran properties have encroached on to it. Seriously need to consider if we need to make improvements to maintain it and ensure it provides safe access. Consideration if the laneway, once improved, should be one way in/one way out. These details will be determined at site plan. The process is typically that used for the sale of lots. Sale of road allowances and right-of-way are a little different. Affordable housing – how can we promote it? Mr. Basic indicated the Region does have numbers in terms of dollar values. Maybe the applicant can address it. Denser developments with smaller units are generally more affordable. Don’t like stucco. The architect noted that it will be stone and brick on the first floor with the upper floors stepped back and stucco/lighter weight so it doesn’t look so “monolithic”. Need to see the streetscape renderings showing scale to existing buildings. Mr. Ariens noted it was included in the original urban brief for the 8 storeys. The Chair noted that nothing has been provided subsequent to that. With the changes, the committee would like to see the renderings/streetscape from different locations. Traffic increase and congestion. Mr. Basic noted that the traffic modelling used by the developer was not preferred and that the Town’s consultant model was better. Two separate traffic studies were done that both generally agreed. What has the Region said about traffic lights (Ontario/Main, Elm/Main) and feedback on the entire proposal? The SGL consultant responded that the Region commented on bicycle infrastructure but nothing specific with regard to traffic impact. Mr. Basic stated that this proposal would not have significant impact on Main St.
Further reduction in shared parking (8 instead of 9 for restaurant; 7 instead of 8 for retail) in exchange for access to the laneway through the building structure to Doran. Mr. Ariens stated that they did not want to extend the alley through the building but that Town staff insisted that connection be made. Adjusting the number of spaces or reducing the number of units could be done at the site planning stage. SGL has included the additional reduction in parking spaces in the wording of the zoning amendment. Need sidewalk on Doran all the way to the school. SGL report states that the school board will need to negotiate this with the private landowner. Traffic issues with school buses and vehicle ingress/egress. Member Gillespie stated that the school board needs to deal with these traffic issues. Infrastructure not capable of handling the development. The sanitary sewer stub line on Doran was built in 1929. The developer would be responsible for upgrading the sewer connection on Doran and if the hook up is to Main St, that sewer “has its own challenges”. 5th storey is only 4 penthouse lofts. No comments from the fire department were included in the report. This is an important issue and should be included. Enforcement of shared public/private parking restrictions. Currently the Town has no similar arrangements. This will need to be addressed. The Cultural Heritage Report was not complete and there are significant deficiencies noted in the peer review report. The OPA and ZBA application should not be advanced until all outstanding issues on heights, scale, massing and setbacks as identified are brought back to committee. The Chair made a point of noting that although they had “made a mistake” by not posting the sign 20 days prior, the developer’s representatives had also “make a mistake” by not providing updated streetscape renderings as they had “lots of time to prepare it”. Despite the smaller than expected turnout due to the notice sign not being posted in a timely manner, residents posed many good comments and questions, with some of the residents very passionate about how this development will affect their neighbourhood. Needless to say emotions ran quite high and at one point there was an unwelcome verbal exchange of personal matters between a resident and the Chair. After calling a short recess for things to cool down, the meeting resumed, the gentleman apologized to the Chair and the public meeting continued. As the 11th hour approached (literally it was almost 11:00 PM), the decision to move forward with the laneway acquisition was approved while the remaining report was deferred to the next Planning and Development Committee meeting. This author will note some behavioural analysis of the Committee that evening. With the exception of the Chairman and Member Gillespie, they were unusually animated and very positively expressive of this plan, like it was the best thing since sliced bread. Not sure what it was… maybe the water? At the end of the meeting as they tried to figure out how to draft a motion, it literally turned into a nail-biter… as Alderman Seaborn was doing. She was definitely displaying a multiplicity of indicators of nervousness, it was rather odd. And that, staff is hereby authorized to commence the process for the disposition of the lane described in the report in accordance with Town policy. And that, the lane not be sold until approval of Zoning Amendment occurs. 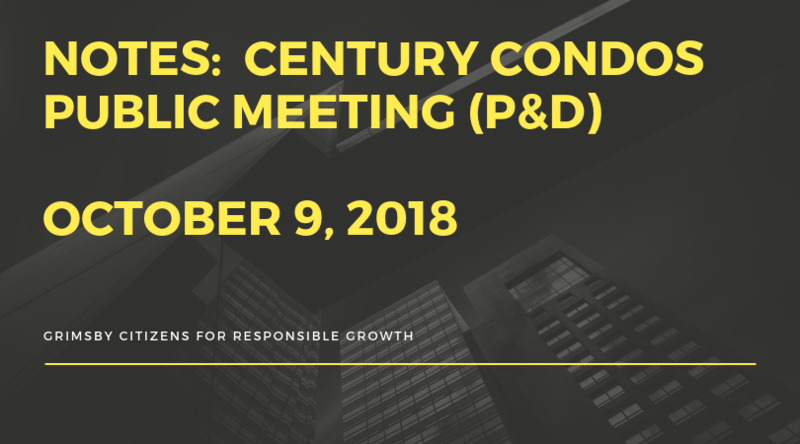 If you didn’t get wind of this public meeting, be sure your calendars for November 13, 2018 when the second public meeting (which will be in accordance with the Planning Act) will occur.